Northern Penobscot County Maine received a HRSA Rural Communities Opioid Response Planning Grant to work as a coalition of partners to enhance substance use treatment services. 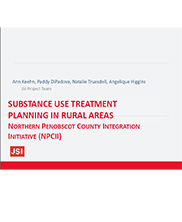 The Northern Penobscot County (Maine) Integration Initiative (Network) collectively assessed the lack of local substance use services to support expanding services and strengthening the rural health care system as a whole. In partnership with JSI, the network assessed current level of need, service gaps, and models of service appropriate to their rural setting. Using a strengths, weaknesses, opportunities, and threats (SWOT) analysis, the Network developed a strategic plan to support the emerging rural collaboration efforts of the network members. This presentation, made at the 2018 New England Rural Health Roundtable Conference, shares what was learned through the process in Penobscot County Maine. JSI, 2018.